What Causes an LP Oven to Soot Up on the Inside? LP stands for liquid (or liquefied) propane, a common fuel for gas ovens that are not connected to natural gas lines. If you do not live near enough to a natural gas center but want a gas oven, LP is your only choice. These ovens work similarly to a natural gas system and can have similar problems, including soot issues. If you notice soot on the inside of your LP oven, immediately stop using the oven and fix the problem, because this could be a sign that dangerous exhaust is escaping whenever your burners are on. One of the primary causes of soot inside your oven is a weak burner flame. Weak flames do not burn the LP properly and leave high amounts of residue, which stain the oven surfaces. A flame becomes weak when it has low air flow. Sometimes the solution is as simple as opening the supply vent to your oven wide, or cleaning out the vent to remove any obstructions. Gas pressure is another reason for soot. Your burner may be producing a strong flame, but if the gas pressure is too high, it will not be able to burn all the LP efficiently, leading to a collection of residue and exhaust. 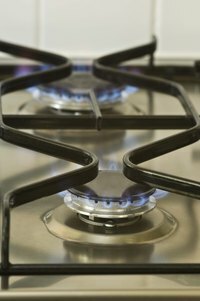 You can lower the amount of gas your stove receives by adjusting the valves. If this does not solve the problem, the issue may lie with the valves themselves. The gas valves protect your oven and house from dangerous combustion and exhaust. However, a valve may become stuck. If it is stuck open, your oven may be receiving too much gas. If it is stuck partially closed, the burners may not be receiving enough gas to make a strong flame. Replacing the valve should clear up this issue and stop the soot problem. If all else fails, check what type of range you have and what it is designed for. While they are very similar, a range designed for natural gas will not function properly with LP gas. The result will be improper burning and a residue of soot on the inside of your oven. You may be able to replace the necessary components with LP versions to solve this problem.